I should state up front that I like for things to be neat, clean, reasonably sanitary, and orderly, but I am not a germaphobe. Four years of living in Ecuador coupled with having twelve grandchildren has knocked that tendency right out the window. And, the truth is that “when you’ve gotta go, you’ve gotta go.” Period. I had heard Italy described as a First World Country, and in terms of well-maintained highways and an amazing mass transit system, I would say that they do a lot of things very well. 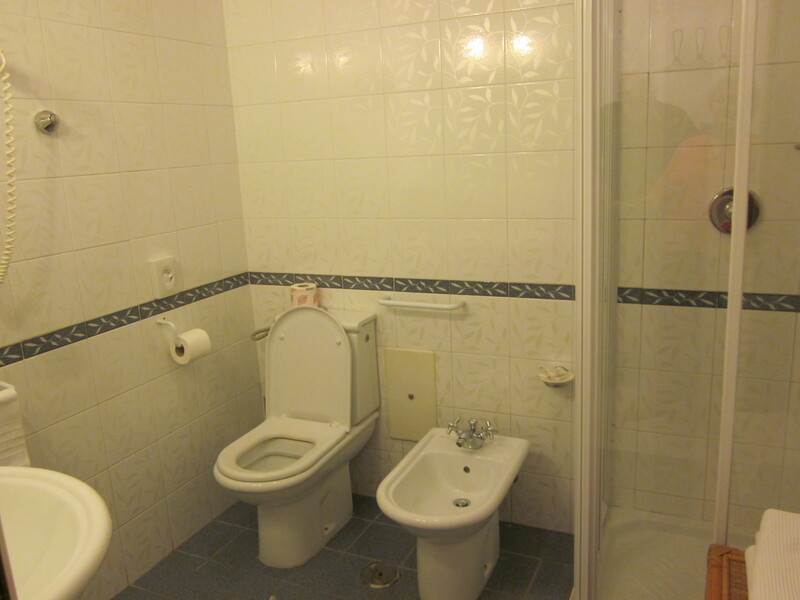 But, in the category of bathrooms, I think there is still room for improvement. The bathroom pictured above was in our first hotel room in Rome. 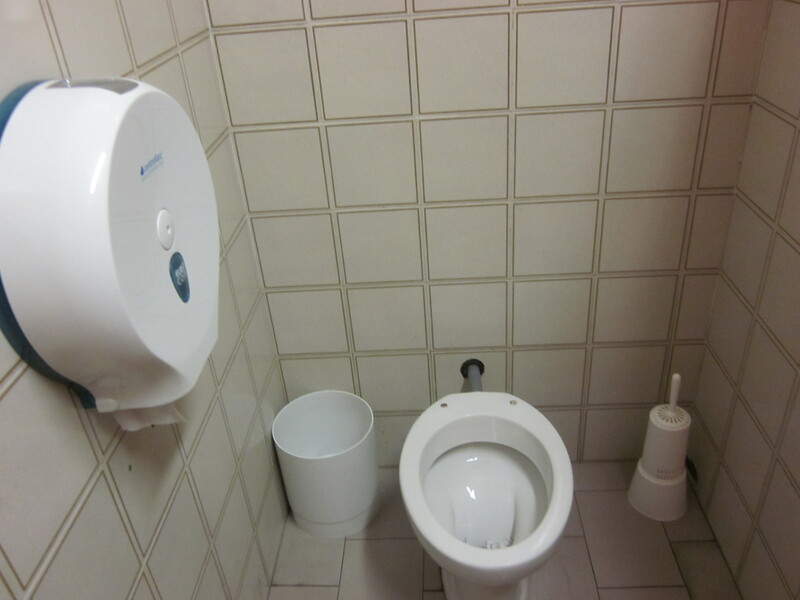 Even though I’m not bidet-savvy, this bathroom was spacious and contained all of the essentials, wouldn’t you say? The bedroom was tiny, but the bathroom was definitely adequate. I breathed a sigh of relief. This second bathroom was in our B and B in Positano. The picture doesn’t do it justice, but suffice it to say, that if I hadn’t lost 20 pounds before we left on our trip, I would have NEVER been able to squeeze myself into that shower. CO-ZEE. But, again, the water was hot, and everything worked as it should. Another relieved sigh. Now THIS bathroom was either in the town of San Gimignano or Siena somewhere within Medieval walls out in the Tuscan countryside. What makes this bathroom memorable is that it was a “public restroom” and I had to pay 1/2 Euro (almost a dollar) to use it. 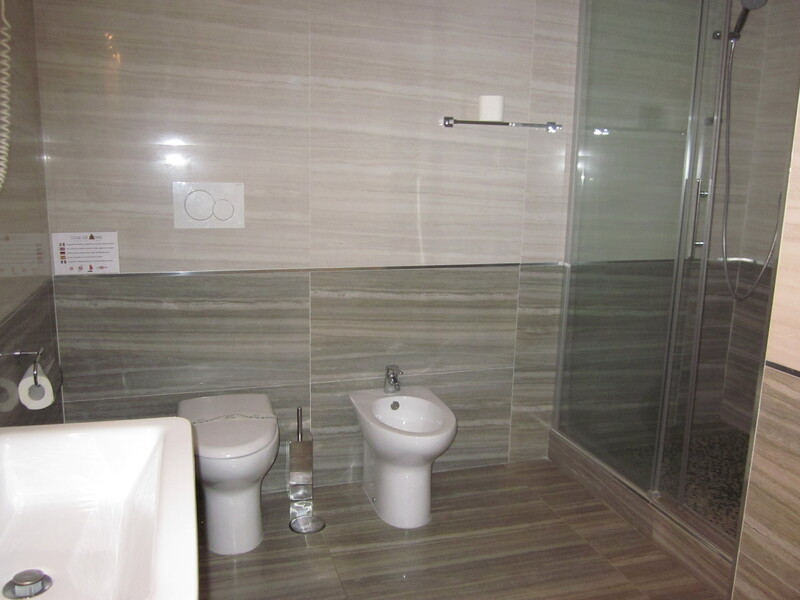 You might notice that there are a few items sadly lacking, such as a rim and a flusher. Another thing about most public restrooms in Italy is that both men and women go in the same door and use the same area for washing their hands. 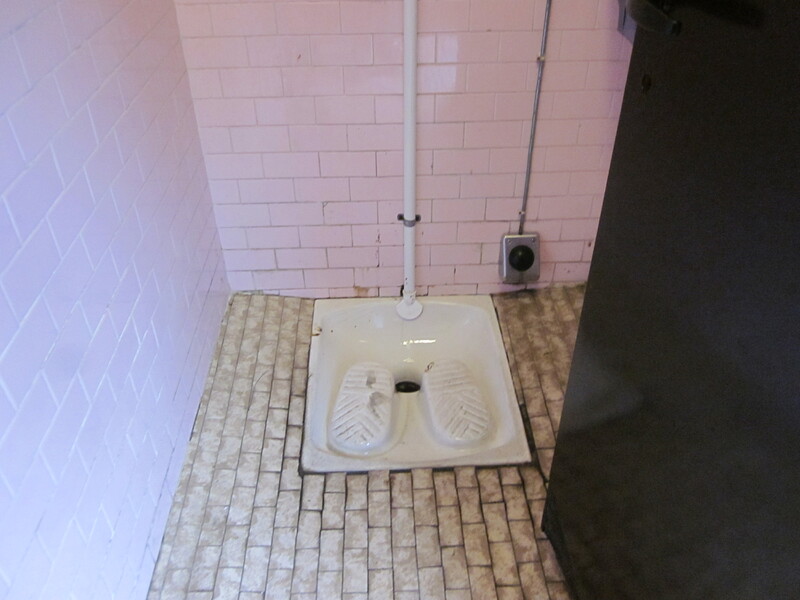 Thankfully, there are separate stalls beside the sink. Still a little disconcerting, wouldn’t you say? This last one pretty much “takes the cake.” Yes, this is the sight we saw — and the facility that was available — at the train station in Varenna on the shores of Lake Como. Kind of takes the “I gotta go” right out of a person, doesn’t it? You can see where you are supposed to put your feet. Now, ladies, use your imagination about the rest. So, when you are planning your trip to Italy, just brace yourself for a wide range of “accommodations” and be ready to grin and muster your courage. On a somewhat related note, we discovered a new product that we used on this trip. DISPOSABLE UNDERWEAR. 🙂 🙂 No, it’s not like Depends. And, no, it’s not noisy like crepe paper or tissue paper. It’s soft, lightweight, and a great convenience to have when you’re traveling. Just think. You don’t come home with a suitcase full of dirty underwear. We had heard about such a product and went to Amazon.com to check out the possibilities. We recommend Onederwear. The average cost is about $2.00 per pair. Yes. The name says it all. Our children have had a field day laughing about all of this (and I’m fully expecting to find some in our Christmas stockings), but I will just repeat that it works well and really helped when it came time to pack only a carry-on bag. I hope this was an educational blog, and maybe it provided a chuckle or two. Stay tuned for more on Wednesday.